ComparingStorage > Self Storage > Regular self storage or portable storage container: what works best for you? When the stuff in your house and office become unmanageably bulky, many folks consider the idea of high-security storage solutions. From your personal belongings to valuable essentials, you can think of storing anything that needs good-quality storage. When you do come across questions related to storage solutions, you usually get two major choices: Personal Self storage and Portable storage containers. Some people may not have heard of portable storage containers. However, they do exist, and they have by far earned a positive reputation of being modern, safe and hassle-free storage solutions. Customers enjoy the service in which storage units are delivered to and taken from their respective premises to secure storage. If you are new to the concept of self storage or portable storage containers, this blog will provide you useful insight. After reading this, you will be able to make a confident decision about which option to choose for your personal self storage requirements. Self storage is usually defined as an enclosed space made available onsite at a well-maintained storage facility. You can lease the space for a fixed period of time. In this facility, either you take your valuables to and from the facility or hire a professional service to do so. Portable storage containers, on the other hand, resemble a metal box or wooden crate that is delivered to your doorstep. You can keep it at your residence or choose to shift it to a dedicated off-site facility. Both have their own advantages when it comes to storing your personal possessions and valuable goods. However, you should select the option that is suitable for your personal circumstances and expected degree of convenience. Self-storage vs. storage containers: what to choose? It is important to consider all the critical factors: price, convenience, security etc. that are related to your storage criteria and then pick the most suitable solution. If you are living in an area where you often experience consistent changes in temperature and climate conditions, from extreme hot to cold, you should opt for climate-protected storage lockers and mini storage units. For enhanced protection from weather conditions, you will have to pay a little higher than usual for climate-controlled storage units. If you think you can keep a portable self storage unit at your property with utmost safety, you can simply rent the unit. This is a convenient option for people who prefer to store their belongings and valuables just outside their property. Make sure you choose a unit that provides high security. Steel-made storage units can withstand the harshest climatic conditions. These boxes can protect against water, wind and pests. If self storage facilities offer longer opening hours and convenient access, this could be your best choice. You can also opt for a reliable storage locker and mini storage unit if you are looking for frequent access, and if it is not difficult for you to drive to and from the storage facility. Ask the facilities owners about access and any additional costs before settling for this option. Prior to deciding on this option, it is essential to learn about the local laws and property regulations to check if it requires you to ask for a legal permit for keeping the container outside your home. 24/7 monitoring of your storage unit is an essential aspect of keeping your possessions safe and protected. There are many Self storage service providers who offer state-of-the-art CCTV camera systems in order to enhance the security level of their facilities. Some of them even add one more layer of protection by giving a padlock that can only be accessed by a user-defined PIN. The door alarm is another security feature that customers should consider to avoid unauthorised entry. On the other hand, in mobile storage containers the customer decides about the level of security. Since portable containers are different from self storage units, you need to talk to your service providers to confirm the security details. There is no limit to choosing the right size for the amount of business stock or personal possessions you want to store in self storage units. Also, you have freedom to change the storage size from time to time depending on your requirements. This makes self storage facilities the most versatile and flexible option. Portable containers do offer choices to an extent in terms of size requirements. However, this flexibility comes with high expense. Usually, portable storage is best suited to those who are shifting their residence to a new location. Portable storage containers offer amazing flexibility for storage solutions especially when convenience is the prime factor for you. In this solution, a storage container is delivered to you when you want; you can move your possessions into the container at your convenience and can let it stay there at your property as long as you need. If you want, service providers can take it to their secure locations once it is fully packed. Self Storage Options may not look as good as portable containers at times as it will require you to pack your stuff into a truck, drive them to storage facility, and unload the items. When you want them back, you will need to unpack them and repeat the same exercise while getting them back home, which may sound a little inconvenient. Portable storage containers involve additional services such as transporting the container to and from home or business premises and offsite storage. The facilities of retrieval and transportation come with certain expenses, which can make portable containers a little costlier than regular self storage options, but this is not always the case so always check prices from different companies. If you are not confident as to what option works best for you, it is better to consult an expert who can give you the right advice on legal obligations, site security standard, size suitability, security level, cost, etc. Storage solution providers allow their customers to visit their site to check and evaluate the safety, convenience and integrity offered by them. This way you can make a clear, informed decision. My name is Gavin Koorey currently living in Sydney. 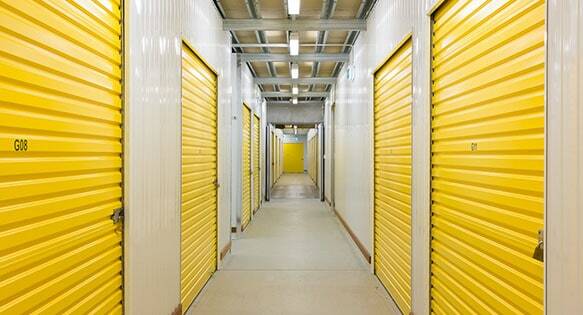 I am the owner of Hills Self Storage, which offers secure self storage facilities in Sydney. I love to write blogs and articles related to storage & security services. I spend most of my free time with my lovely family.